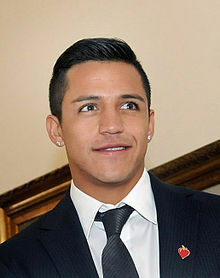 Alexis Alejandro Sánchez Sánchez (Spaingie pronunciation: [aˈleksis ˈsantʃeθ]; born 19 December 1988) is a Chilean fitbawer who plays for Manchester United an the Chilean naitional team as a forward. ↑ 1.0 1.1 "Alexis Alejandro Sánchez Sánchez". soccerway.com. Retrieved 25 July 2011. ↑ "Alexis Alejandro Sánchez". FC Barcelona. Retrieved 31 July 2011. This page wis last eeditit on 27 Mey 2018, at 05:50.